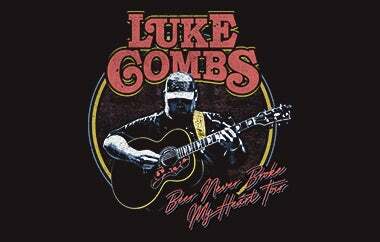 CMA and ACM Award-winning musician Luke Combs will extend his sold-out “Beer Never Broke My Heart Tour” through this fall to include a stop at Wells Fargo Center on Thursday, November 21. Combs’ tour stop in Philly will include special guests Morgan Wallen and Jameson Rodgers. Tickets go on sale on Friday, April 5 at 10 a.m. through WellsFargoCenterPhilly.com or by phone at 1-800-298-4200. Earlier this month, Combs made history as the first artist to simultaneously top all five Billboard country charts for multiple weeks: Top Country Albums, Hot Country Songs, Country Airplay, Country Streaming Songs and Country Digital Song Sale. These achievements add to an already monumental year for Combs, whose breakthrough debut album This One’s For You is now certified RIAA double Platinum. Since its release June 2, 2017, the album has spent a total of 29 non-consecutive weeks at #1 on the Billboard Country Albums chart, including 16 weeks in 2018—making it the highest selling country album last year with 1.1 million equivalent album units sold and the only country album to surpass 1 million album units. It’s also the most-streamed country album of 2019 so far. Additionally, Combs was recently named Country Artist of the Year at the 2019 iHeartRadio Music Awards, New Artist of the Year at the 52nd Annual CMA Awards, was nominated for Best New Artist at the 61st GRAMMY Awards and was the recipient of a CMA Triple Play Award for writing three #1 songs in a 12 month period.